Food supplement. Capsules with butyric acid for dietary regulation of disturbed gut flora. Butifar is an innovative product with butyric acid as the active ingredient. It helps gastrointestinal tract cells to regenerate and promotes the absorption of water and sodium back into the blood, which helps prevent dehydration. Butyric acid is one of the most important short-chain fatty acids for colon cells. Butifar capsules contain butyric acid that’s protected by a special patented lipid layer. 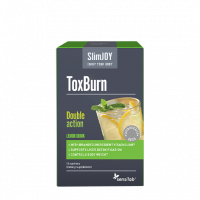 It allows the ingredient to be slowly released along the entire length of the colon, which ensures optimal efficacy of the product. The capsules don't release the active ingredient in the stomach, but in the intestine, where it soothes irritated intestinal cells, helps regenerate and regulate their function. Ingredients (in 2 capsules): Sodium butyrate 300 mg, completely hydrogenated palm oil, thickener: sodium alginate, emulsifier: glycerol monolaurate, capsules: hydroxypropyl methylcellulose, colourant: titanium dioxide, purified water. Use: The recommended daily intake is 1 capsule in the morning and 1 capsule in the evening with a glass of water after a meal. We recommend at least 3 months of use. For chronic inflammatory intestinal conditions (ulcerative colitis and Crohn’s disease) we recommend 2 capsules in the morning and 2 capsules in the evening. The daily dose can be increased according to your doctor’s instructions. The recommended daily intake for children above 7 years of age is 1 capsule in the morning and 1 capsule in the evening with 2 dl (a glass) of water. Important: The recommended daily intake should not be exceeded. Dietary supplements should not be used as a substitute for a varied, balanced diet and a healthy lifestyle, which are important. The product is not suitable for use as the sole source of nourishment. The product is not suitable for parenteral use. The product must be used under medical supervision. 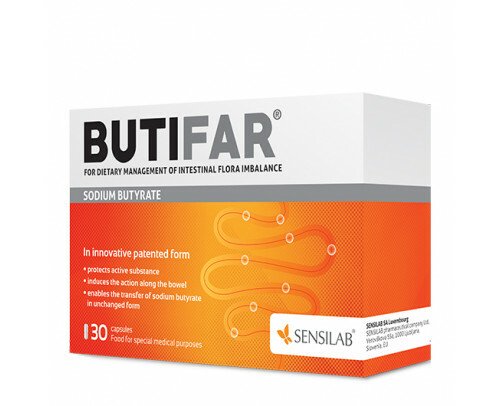 Taking Butifar capsules may result in increased body weight due to improved growth and nourishment of the cells of intestinal mucosa. There may be an increase in bloating during the first stages of taking the product.